“The clientele changed and then the business changed,” recalled Dubliner owner Tom Scanlon. He’s not talking about the impact the Green Line has had on his long-running University Avenue Irish pub, rather changes that the Avenue has seen since he first acquired the business in 1984. At the time, it was a trucking bar. When area transportation businesses shut down or moved out, the bar changed with the times—and they continue to adapt. Transitioning from Ace Bar to the Irish-themed Dubliner in 1997, the trucker image has softened. With vibrant Irish music, a variety of activities and an inviting atmosphere, Dubliner’s doors are open to all walks of life, starting with those in the neighborhood. Dubliner has always been a neighborhood bar at heart. “It’s a very welcoming place,” Scanlon said. “I don’t think anybody feels left out here, and that’s what we’re trying to achieve. That reflects on the owner,” Scanlon said matter-of-factly. While a light-hearted and playful personality, he’s serious about his business and he stresses the importance of customer service and environment. The bar was ready for the train’s impact on business and embraced the changing landscape. They already had a parking lot, which alleviated some of the financial challenges of construction, and they revamped and remodeled before the new route opened to the public by building a patio and updating the bar’s live music stage. Along with the jovial and always inclusive music and dancing inside the pub, Scanlon’s personality shines throughout the establishment. That’s a natural part of any business, he believes. “I don’t think you could help it. Any bar you go to in the city it’s a reflection of who the owner is,” the spirited Irishman said over an afternoon cup of coffee. 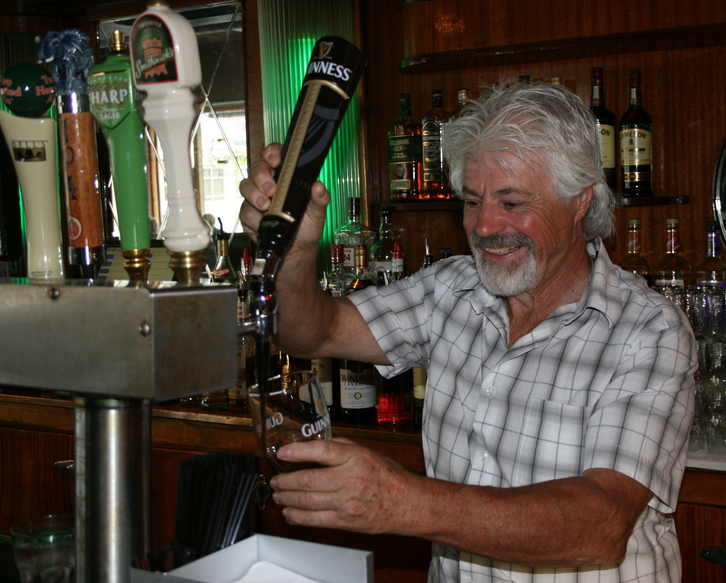 Born in Ireland, he arrived in St. Paul in 1965 and eventually found his way into the bar business. After briefly running Scanlon’s Irish bar on Grand Avenue in the 1990s and, for a time, owning the Turf Club just down the street, he is now solely focused on Dubliner. The bar has events most nights of the week, ranging from Irish music sessions, monthly sea shanty sing-alongs, set dancing, and live music—almost always free. While there is a predominant Irish bent to the entertainment, they also feature American-styled acoustic folk and sometimes jazzy and blues music as well. A change from the light rail is the popularity of pub crawls, brewery tourism and the convenience that the train provides sports fans. Dubliner will open early on Vikings and Gopher game days, but the neighborhood customers are still the pub’s identity—and are also aided by the train. Dubliner sees more first time visitors now, but they’re mostly nearby residents who appreciate the added convenience, Scanlon says. “It’s opening up who our patrons are but not changing them,” added his wife and business partner Geri Connelly Scanlon. Besides, Tom joked, the regulars like seeing new faces. “It gives them somebody else to talk about,” he laughed. Located a third of a mile from the Raymond Avenue stop, Scanlon feels those next to the stations are the direct beneficiaries. “People like that convenience of jumping off and going in,” and if Vandalia Avenue had been awarded a stop, it likely would have changed the dynamic. At their corner, time has changed the atmosphere more than the train itself. “We were out here in the wilderness by ourselves for a long time,” Scanlon says, but the environment is changing. Urban Growler and Bang Brewing are nearby, and Lake Monster will open within one block later this year. As the scene changes, Dubliner adapts to their neighborhood. In addition to Irish beers, the taplines are now mostly local beers, and Dubliner works closely with Creative Enterprise Zone artists. Meanwhile, the train has helped convenience of transit, but its impact on trucking concerns the Scanlons. With a narrow University Avenue, semi-trucks have difficulty maneuvering their corner and often jump the sidewalk—and have even knocked down their awning. “People on that corner are in danger,” says a concerned Geri. “They keep telling us they’re going to reroute those trucks but it hasn’t happened yet,” and it’s not uncommon to witness an accident outside of their building. The city may be evolving and the neighborhood shifting, but it remains a constant that Dubliner’s primarily concern is their neighbor. More information about the Dubliner Pub can be found here. Enjoyed this piece Loren Green. Nice update on our city of St. Paul, it’s people, business and how we all adapt to the only constant in our lives, change. I would also venture to say that this Irish saloonkeeper, Tom Scanlon, would be the only Ireland born pub owner in the Twin Cities. [Editor’s note: This is part of a series on businesses along the Green Line, one year after opening. We interviewed SugaRush Donuts and other University Avenue businesses in 2014 as part of a Minnesota Historical and Cultural Heritage Fund grant.